Princesses Kimono Vs Cheongsam is a dress up game at Gogy 2 girls games. Do you the Japanese woman could wear kimono? Princesses Elsa, Anna, Ariel, and Rapunzel will try new styles of clothing: Kimono & Cheongsam. Can you help them? Why do you think the game is so popular? The girls decided to start a changing parade. ♪ Na na na na na ♪ ♪ Come on, come on, come on ♪. Help them choose beautiful clothes and accessories and see what kind of style is more suitable for them? I think both styles are all very very good. So do you think we're ready? Have fun looking like Princesses Kimono Vs Cheongsam at www gogy! Share the game with your friends to have fun together. We are so thankful to receive your comments. Rate it with five stars to express your emotion to us. 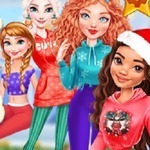 Many interesting games are waiting for you on http://www.gogy2.xyz such as Disney Princesses Scuba Diving Dress Up and Disney Super Princess 1.